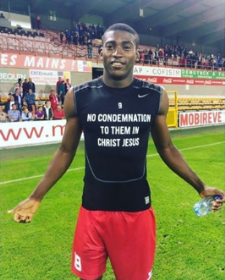 Taiwo Awoniyi has repeated the feat he achieved seventeen months ago after scoring on his second debut for Royal Excel Mouscron as they registered a 2-1 win over KV Oostende in the Belgian First Division A on Sunday night. The former Nigeria U23 international had celebrated a goal on his first debut for Royal Excel Mouscron against KSC Lokeren on August 12, 2017 in a 2-0 win. This is the fastest debut goal Awoniyi has scored in his young career as he found the net four minutes after his introduction in the second half. With the scoreboard reading 1-1, manager Storck's decision to throw the Liverpool loanee into the fray in the 64th minute paid off when he slotted the ball past goalkeeper Dutoît. Last season, Awoniyi went on to score 11 goals (7 assists) in 32 appearances for Royal Excel Mouscron before he suffered a season-ending hamstring injury. The 21-year-old did not have a goalscoring debut for his former clubs FSV Frankfurt, NEC Nijmegen and KAA Gent.